Oh.. wonderful Argentina, known for its Tango, paros, acado and el vino Malbec! I am sure you have experienced all of this in Argentina. You might also already plan to take a class of tango, as Argentina is where Tango was born. However, do you really know about the history of tango? Do these names sound familiar to you: Pichuco, Piazzolla, Goyeneche, Merello or Castillo? Do you know what “el Fileteado Porteño” is? If not, El Tour de Fileteado Porteno, organised by 054, is going to open your eyes to a new side of Buenos Aires’s culture! Let me tell you a bit more about this tour! 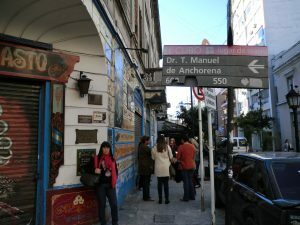 First, the meeting point of this tour is at Anchorena 550, la esquina Paseje Carlos Gardel in front of the Abasto Shopping mall. You can take Line B until Carlos Gardel subway station. The tour will last 3 hours, which includes the workshop at the end of the tour. 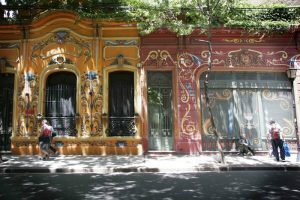 During the first part of the tour, you will learn about the history of the Fileteado Porteno, which is a decorative art that was invented in the 20th century in Buenos Aires. 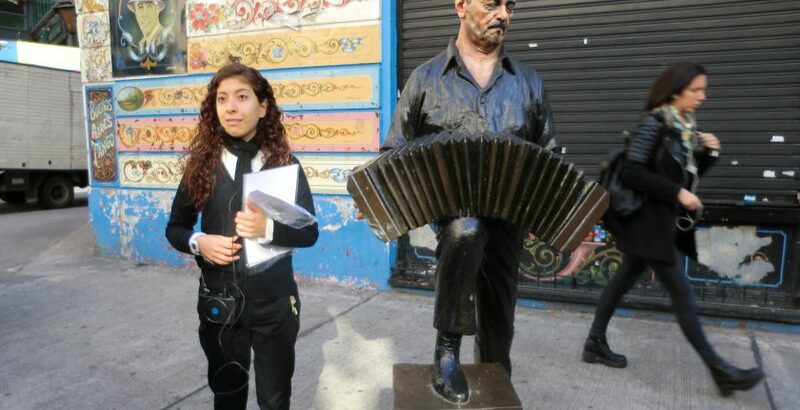 After you will go down, Carlos Gardel’s street, where you will be told the story behind each statue of important musicians, singers and influencers of the Argentinian culture. Later on during this tour you will see the house of Carlos Gardel. Unfortunately it is not possible to take a look inside of his house as it is being renovated. In the last part of the tour, there is a workshop on: How to paint a Fileteado Porteno. This part is my favorite part. 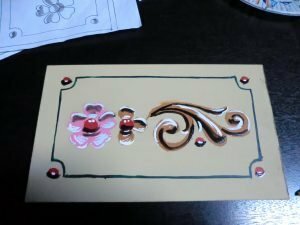 It is such a fun activity while it asks a lot of concentration and technique from you. Yup, it is not as easy as it looks! Luckily, we had instructions from Gustavo Ferrari, El fileteado, who started to be an independent Fileteado after two years of learning with A. Genovese. This workshop takes about one and a half hour with a little break with coffee/the and pastries! Overall the workshop is a lot of FUN while still being an educational experience. I strongly recommend to go do this tour, it is definitely worth it! Last but not least, you get to take your masterpiece home with you!